ALL-NEW ARC! ALL-NEW JUMPING-ON POINT! The march toward the greatest Valiant milestone of all time starts here as X-O Manowar begins 'LONG LIVE THE KING'! They are The Torment - and their name means death. Thought to be a legend by the extraterrestrial empire called the Vine, they have now become Earth's violent reality. They have traveled for eons to reach us?in search of Aric of Dacia, the unstoppable X-O Manowar. How can Aric of Dacia defeat an omnipotent threat nearly as old as the universe itself? Will the X-O Manowar armor truly be our world's salvation, just as the Vine's myths foretold? Is this the beginning of the end for X-O Manowar?or the beginning of something bigger? 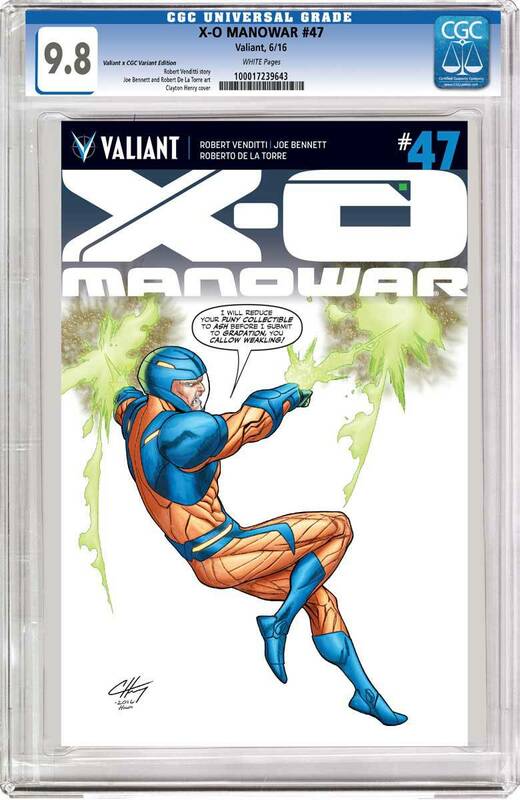 Plus: The X-O MANOWAR #50 COUNTDOWN GIVEAWAY begins here! Each issue of 'LONG LIVE THE KING' comes bagged with one of 50 exclusive micro-prints from comics' leading talents?or full-blown ORIGINAL ARTWORK!